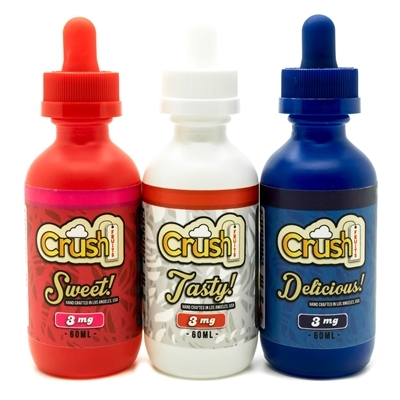 A great line of juice flavored e-liquid packaged in 60ml bottles with a 30ml price! Sweet – A smooth and subtle hard candy with gentle watermelon undertones that is sure to keep you coming back for more. Delicious – A delectable blend of Gummy candy treats with a surprising tart finish that is sure to impress any candy junkie. Tasty – An irresistible fusion of pineapples and strawberries creating a vortex of flavor that is sure to please the most sophisticated of palettes. Wonderful – This captivating concoction of raspberries and cotton candy will keep you intrigued to the very last drop! Divine – This silky delight is a peach infused milky surprise that has a tranquil touch and will leave you with a pleasant aftertaste.